There is more cheddar cheese in Muscat than in Jerusalem. In fact, there are like five different kinds of cheddar to choose from. We’ve had nachos for dinner twice now. The traffic is much better than it was in Casablanca and the city less hectic, but there isn’t a French bakery around the corner. The street food in Amman was better, but there are gobs of Indian restaurants in Muscat and I have to spend limited amounts of supervised time in the spice isle here so I don’t pass out with cooking potential excitement. This is both the best kind of thinking and the worst. The most illuminating and the most stifling. New places make you think about the way things work and what that says about the people and geographies that have engineered these things. You compare food, clothing, shopping, communication, street names, driving habits, recreation, public worship, family interactions, social structures, government and rumored private behavior to better understand politics, religion, geography, history, power – humanity. What is shared, what is different and what does it mean about them, about me, about us? I’m not saying that you always or even ever get a place right, but the exercise has value. Making observations about grocery store selection and street signs helps me understand values and make sense of histories. But there is also the danger of setting yourself up for negative experiences by applying definitive, evaluative, and often misinformed assessments to anything new. Becoming someone who travels or moves to a new place and spends the whole time complaining “It was easier/better/more fun in _______________ than it is here.” You bluster forth in a whirlwind of romantic energy about the place you left and how perfect it was – pre-empting first impressions and spoiling your time by not trying to figure out what a new place is. What it ACTUALLY is. This, along with touching, is one of my growing pet peeves. Someone said to me recently that Jordan wasn’t even really in the Middle East because it didn’t have souks and fun medinas and nice people* and other Middle Eastern stuff. I objected then, but in the weeks since I’ve actually grown livid about it. We, outsiders, don’t get to tell a place what it is and what it isn’t. Coming to a new country with Orientalist expectations (or whatever people have in other parts of the world) of what a place should be and determining it “bad” or even “good” – as if our narrow personal experience unequivocally defines a place, its people and its values - is paternalistic nincompoopery and a waste of time and energy at the very least. It is for this reason Paul Theroux, remarkable travel writer and noted misanthrope, hates the internet and many industries that have bloomed around travel. They rob people of primary, primal experiences and the opportunity to make their own assessments. People arrive with photoshopped pictures of Vietnam and are inevitably let down by what they find “That doesn’t look like Ha long Bay from the calendar… I don’t like it here”. As a photographer and travel blogger the irony of this gripe is not lost on me. I experience pretty regular paralysis about how to share the things I love without making travel about shallow consumption or participating in the Conde Naste-ing of it all. I can’t think of a way to do that entirely, and so for now I just continue. All of this is to say that during this first month in Oman I have been watching and learning and asking questions and making comparisons and trying to figure things out. It’s normal and it’s not bad, unless it holds you back from getting to the why and what of a new place. So far we are loving, loving Muscat. I’ve tried to keep my comparisons fair and revealing instead of evaluative and definite, but honestly, it’s pretty great here. We love our house and our neighborhood and have made many new friends. Max likes his job and has a lot to do and I’m about to start my dream job next week at the International School library. Our dog is happy, my kitchen is huge, the people seem nice and the city is lovely. Our car should arrive next month and I'm already itchin' to get out and explore the beaches and mountains and wadis. In the mean time, I'm working on my donotgetsunburnedtoacrispafterfivesecondsinthesun which is very different than working on a tan. As a small postscript: our stuff arrived today! By accident (or gross misfeasancee it’s hard to say) our stuff was never even sent to the location where a fire might have burned it, but shipped immediately to Muscat. We spent the last few weeks just sure that not only had our candles and other liquids melted, bubbled and exploded in the heat, but that our printer, mixer, and ceramic dishware had oozed back into their component elements as well. None of that happened. Sometimes I overreact. Thank you to all who wished us and our stuff well. *We met MANY wonderful and nice and hospitable people in Jordan. So much so that we were convinced we wanted to make a career in the Middle East. A whole chicken in Muscat comes clean and perfectly trimmed. The insides have been removed and the feet firmly trussed. Lovely, accessible, recognizable, orderly, immediately usable. Muscat has seemed much the same way since our arrival, but today we are home after the announced Embassy closure through August 10th and that has shifted my thoughts to other homebound pursuits. My jet lag those first few days woke me up between 4 and 5 am. The light streaming through our bedroom window was warm and beautiful and the temperature quite pleasant compared to the noon day burn. A few days in a row I pulled on a flimsy yellow African style dress I bought In Essaouira, my wide brimmed straw hat, and set about pulling weeds in the planters that line the yard. With my bare hands I scraped through the dirt, pulling out gnarly growths by the roots, removing large rocks and other debris from the beds. My fingers weaved through the spiny weeds, getting them just around the base to avoid blood. 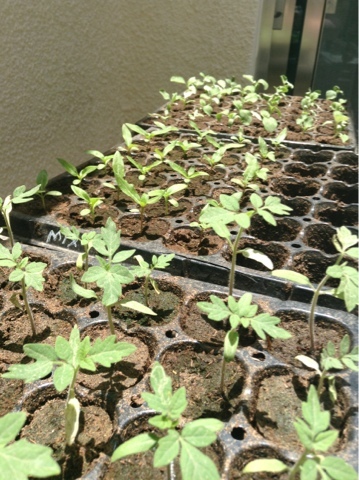 Last weekend I bought small tomato and eggplant seedlings to plant around the yard. Inside I sowed seeds for rosemary, thyme, chives, oregano, savory and basil in empty egg cartons that are resting high on a shelf in the laundry, sweating and germinating in the filtered sunlight. What can you do but wait? Wait for the little seeds to crack open, their insides snaking to the surface and peeking through. Wait for the tomato plants to grow just a few more inches before planting them in the raised bed I fashioned from discarded bricks stacked up among the weeds. Wait for the Embassy to reopen and life to continue as normal. Wait for the narrative to change? But then I remember that Max's job is not just about waiting. I'll cheekily almost avoid a tremendeous cliche by only alluding to a planting metaphor, but we are here because we really believe there is more to be done than just waiting.